You are here: Home » Blog » Guidance and Advice » Wet Chemical Fire Extinguishers Get The Facts For Fighting Oil And Fat Fires Here! 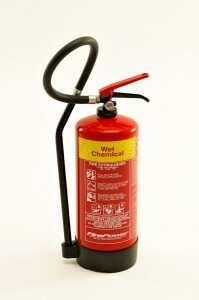 Many people have never heard of wet chemical fire extinguishers let alone have them in the right places next to hazards. Did you know that your general run of the mill fire blanket has these limitations? Please read the instructions on your fire blanket at the warnings its should say all this on it. 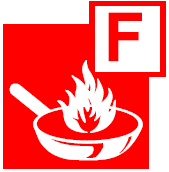 All other general fire extinguishers are useless on cooking oil or fats fires in fact using them could be very dangerous indeed and thats why you have to be sure your extinguisher has the “Class F” pictogram on it. Make sure you get a credible fire risk assessments carried out by a competent risk assessor who will highlight if your covered correctly with the correct amount and types of fire extinguishers in line with BS5306-08. Please watch this Youtube clip to the Heathrow Airport fire which shows all types of fire extinguishers attempting to put out a burning oil / fat fire and make up your on mind on which works best. This entry was posted in Guidance and Advice and tagged chemical, dumbartonshire, extinguishers, Fire, fry fighter, glasgow, inverclyde, lanarkshire, maintenance, paisley, sales, servicing, stirling, supply, types, wet. Bookmark the permalink.